German educationalists seem to have invented both the main diagramming systems taken up in the UK and the USA: tables and trees. Comment. For a certain understanding of speech, to which grammar gives rise, it is important that one should recognise easily and quickly to what kind of sentence-relations a member of the sentence belongs as ‘factor’, and whether it is headword or relation-word in the same, and that one should give each member of the sentence its place and significance in the whole. This businesss – the analysis of the sentence – is made easier for the beginner if he notices that two members express a predicative sentence-relation when they express a thought, and an attributive or objective sentence-relation when they express a concept, namely first when they express the concept of a being and lastly when they express the concept of an activity. It reflects a deliberate break with the Latin-based grammatical analysis which had till then dominated schools in Germany, as in other countries. 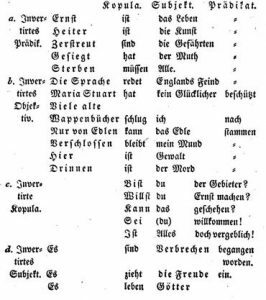 The first column (without a label) is what is now called the ‘Vorfeld’ (‘forefield’), the one element before the verb, which has no equivalent in Latin. It rejects the logical analysis of the sentence into just two parts: subject and predicate, where the verb is part of the predicate. Instead, it presents the verb as the link (labelled ‘Kopula’, containing any finite verb, not just the traditional ‘copula’ BE) between the subject and the predicate. 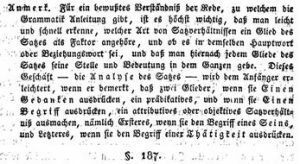 This idea was also published a few years later by Wilhelm von Humboldt, who saw the verb as the word which brings ‘life’ to the otherwise inert subject and predicate (Sériot, Patrick. 2004. L’affaire du petit drame : filiation franco-russe ou communauté de pensée? (Tesnière et Dmitrievskij). Slavica Occitania, Toulouse. (93-118)). They were applied to English by an American, Josiah W. Gibbs, in his Philological Studies with English Illustrations (New Haven: Durrie & Peck, 1857), though without the table notation. In addition to the educational aspect, it seems that familiarity with the early nineteenth-century German grammarian Karl Ferdinand Becker (1775-1849) was crucial: Becker’s system was what caused English grammarians in the United States to abandon the traditional synthetic approach to sentence analysis and adopt a binary division of sentences into subjects and predicates. Note, moreover, that we encounter in this period the notion that grammar was the study of language in general and also the novel idea that it had already become a “science.” Accordingly, scientific-sounding terms like “analysis,” “synthesis,””element,” and “structure” enter the picture. At the same time, the focus on relations (rapports) that we have seen in Nicolas Beauzée was added to this intoxicating terminological mixture. 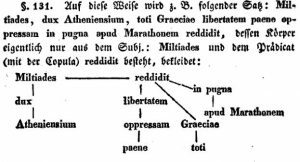 The first network representation for a sentence seems to have been this one, from page 102 of Lateinische Syntax für die obern Klassen gelehrter Schulen. Leipzig: Weidmann (1832), by Johann Billroth. The diagram shown here is the only one in the whole book, and I don’t know whether anyone else followed this lead. But it’s hard not to be struck by the similarity to the much later Reed-Kellogg diagrams! 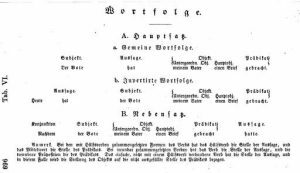 Little seems to be known about Johann Billroth, but it’s possible that he is the Professor Johann Billroth who died in 1836 in Leipzig and also the father who died of tuberculosis when the surgeon Theodor Billroth was five – i.e. in 1834. If he did die in the 1830s he had little chance to spread his ideas, or his diagrams. According to a document by Hodges, the philosopher Gottfried Frege was probably the first to use trees in linguistic theory (1879), and may have learned such trees from a text written by his father for 9-13 year olds, (Frege, Karl Alexander. 1850. Hülfsbuch zum Unterrichte in der deutschen Sprache für Kinder von 9 bis 13 Jahren (second edition). Wismar. 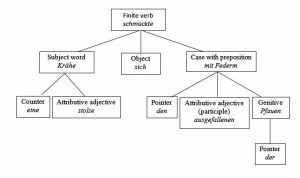 ), which has been described as taking a word-based approach contrasting with the currently popular sentence-based approach of grammar books by Becker and Wurst (discussed above). Like the Reed-Kellogg diagrams, this can’t really be called a ‘tree’ because of the horizontal line at the top. This line reflects the dominant sentence-based view that the basic structure of a simple sentence divides it into two equal parts, the subject and the predicate. Kern’s influence spread beyond Germany to countries including Sweden (Natanael Beckman) and Romania (H. Tiktin). (source:Coseriu, Eugenio. 1980. Un précurseur méconnu de la syntaxe stucturale: H. Tiktin. In Jean Bingen, André Coupez & Francine Mawet (eds. ), Recherches de Linguistique. Hommages a Maurice Leroy, 48–62. Brussels: Éditions de l’Université de Bruxelles.) It’s possible that it inspired the much later (1959) stemmas of Lucien Tesnière (who had ample opportunity to learn about Kern’s diagrams while he was studying Germanic languages in Leipzig just before 1914, though he doesn’t mention Kern in his main book, the Eléments de Syntaxe Structurale). The most obvious difference is the treatment of the preposition (mit, ‘with’) as a marker of the noun with similar status to the latter’s inflectional case. In 1900, Wilhelm Wundt introduced a completely different analytical notation which inspired Leonard Bloomfield to invent Immediate Constituent Analysis. Here’s an elementary diagram for simple sentences from page 329 of his Völkerpsychologie, eine Untersuchung der Entwicklungsgesetze von Sprache, Mythus, und Sitte. Erster Band: Die Sprache. Zweiter Teil. (Second edition 1904). He mentions Kern once (page 230), only to reject his approach because it presupposes the notion ‘finite verb’ (missing e.g. in Chinese). In this diagram, G = Gesamtvorstellung, and A and B are the subject and predicate.